Nearly everything you need to know. This guide will help you audit, iterate, and improve your alumni community with better data. Maybe you are a school with an in-house alumni team, a student group with a spreadsheet, or a camp starting to engage its counselors. Likely, you have some alumni and a strategy to engage them. The strategy could be to do nothing, or it could be a multi-platform engagement strategy. Sophistication is not the key to active alumni. Alumni will open the emails relevant to them, attend the events they care about, and give to the organizations they want. Personalization and context are gateways to active alumni and alumni data the keys. The most effective alumni strategies share one thing, an emphasis on clean, up-to-date, alumni data. If the mantra of real estate is “Location, location, location”, the mantra of successful alumni programs is “Data, data, data.” Tech firms already know this. Google and Facebook are so successful because they have up-to-date user data that they use to achieve all of their goals. Data is the new gold and most alumni programs are missing out. It’s something to be cherished, maintained, and improved. But what is alumni data? Who needs it? And how do you know if you are using it correctly? This is a comprehensive guide to improving and adding an alumni data strategy to your program. It lays a framework for improving your data so that you can communicate, fundraise, and engage your alumni community. How to assess your alumni data? How do you get good data? How do you measure your strategy? Send out newsletters to alumni? Organize alumni reunions and meetups? Connect, or want to connect, members and alumni? Want to understand alumni outcomes? If you answer yes to any of those questions, you need an alumni data strategy. Why? Well the only way you can achieve these outreach outcomes is if you can reach the right people, at the right time, with the right message. To do that, you need data. What groups typically fall under this category? All these groups care about their alumni activities, because they want to maintain and improve their communities. The core value of these organizations is often the people themselves. Alumni are crucial to maintaining that community. A college and camp may seem like separate entities, but to an alum they are similar. They both are learning experiences with people that they care about. They are transformative life experiences. Both should care about alumni data because they need it to engage. Is your group a community group that wants to engage past members? Then you need alumni data. So you can identify unique individuals. The first type is what makes an alum an alum. It could be their name and class year. It could be a unique ID in your database system. The second type are communication data points. They are core to engagement. How do you contact someone? What is their email address? Phone number? You must ask these questions before reaching out to someone. In order for you to engage an alum, you must first be able to contact them. The third type are nice to have. Where do they work? Where do they live? What did they do while in your group? These data points are crucial to improving communication. Sending out a personalized email, knowing where someone works and lives, will see way higher engagement than a generic message to an anonymous email. Effective alumni programs outshine their ineffective counterparts because their data is more up to date, they’ve prioritized the important fields, and they have more context on their alums. Data has a tiered value within each type, uniqueID, communication, and context. A personal email address is more useful than a work email address. A cell phone number more important than a home address. Current job more important than past job. Check back soon for a data prioritization list to help you understand what fields are most important for your job. How to assess your alumni data quality? So you need data, and you know which data points are most important to you. How do you determine how good your data is? You need to do a data inventory. A data inventory assesses the current strength of your database and sees if there are any gaps that you should be working on. It’s an easy assessment to determine what your priorities should be. Create a shareable document with the Inventory questions. These could include IT, Alumni, Center for Professional Development, Development etc. Anyone invested and involved with nurturing alumni and their data should be invited. Tag each question with [NAME - DEPARTMENT]. This indicates who should answer them. Schedule an hour long meeting to discuss inventory and next steps. Schedule follow up meetings as necessary. Assess Alumni Data goal completion at regular intervals. Share Inventory document with new stakeholders. Reassess if Alumni Data Inventory Document has changed yearly. By the end of the assessment, you should have outlined your current data situation, gotten all the stakeholders on the same page, and created a list of next steps to improve. How do you get good data about your alumni? There are two ways to get alumni data. The best is directly from users. When they update their information, you can be sure that it is the most up to date and it is what they want to share with you. The second way is through third parties. Third parties are a great way to get lots of data at once for relatively low cost. The problem with mass data enrichment is data accuracy and communication. Big data is not perfect. For instance, Wavelength can enrich data on ~60% of emails (career info, social profiles, locations etc) with 95% accuracy. This is really good, but what happens to the 5% that has incorrect information? You don't want them to have a poor experience when you tell them you have that data. Learn how Wavelength effectively communicates with alumni to deal with data accuracy and collection so that everyone has a positive experience. It's not just what data you collect. But how you collect it. Users care deeply about their data privacy. You need to be transparent and give them control over their data. When you enrich your data you need to make sure that your data partners are finding information legally and ethically. Alumni will ask you how you got your information. When Wavelength collects data, it makes sure that its data partners are committed to user privacy. How do you make sure your alumni data strategy is working? Users update their information when they think you provide enough value. Your alumni data strategy is working when users update their records at regular intervals. There are a lot of people on the platform already. It isn’t an empty house that no one uses. People actually use the platform. They want to be a resource. Wavelength is built on transparency and control. Users log into Wavelength, see the data that an organization has about them, and wants to update it because they want to help out other members of the organization. It’s not about keeping admins in the know, its about keeping their colleagues and friends who are also members of their organization up-to-date. Check out Why do users update their info? And why is it so important? for a deeper understanding of what makes an alumni network useful. Your alumni data strategy will drive all aspects of your alumni relations. Without a solid strategy you can't keep track of your members or engage them. But once you create a strong strategy, you can start making the most of your community. It's a great way to help current members network and be resources for each other. Don't forget to come back and visit this page. 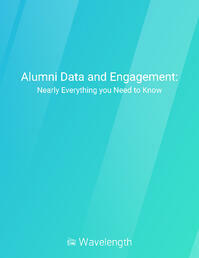 There is so much to cover about alumni data that it gets updated regularly. Feel like this guide has been helpful? Download your copy today.